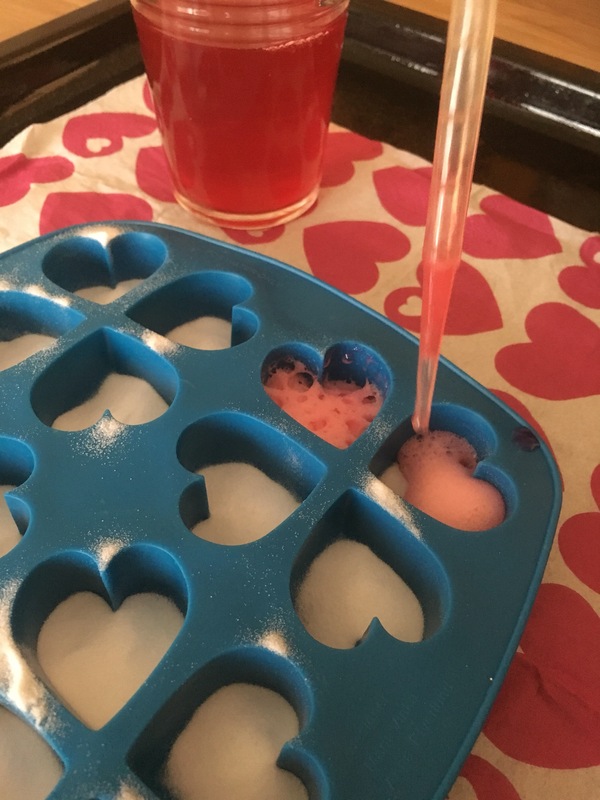 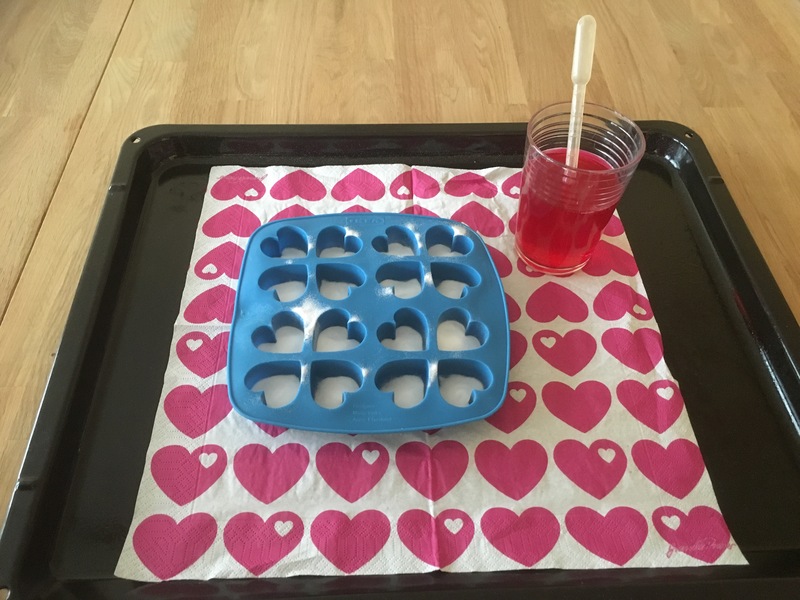 I saw this easy little ‘experiment’ on pinterest, and decided to set it up for Ted. 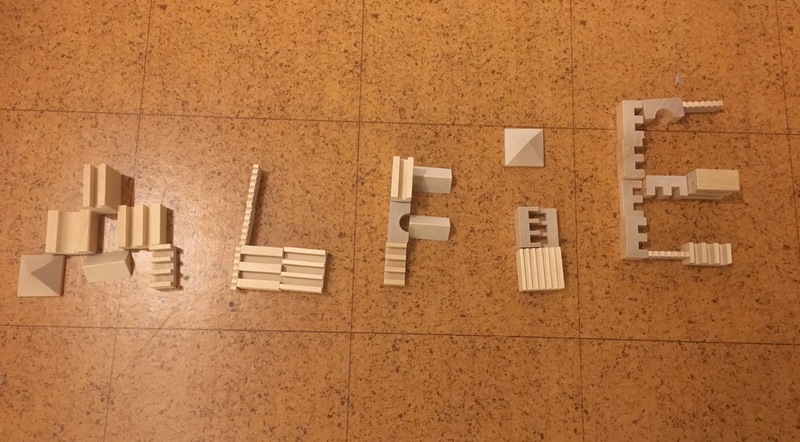 I’m trying to teach Ted his letters, in a playful manner, before he starts school after the summer. 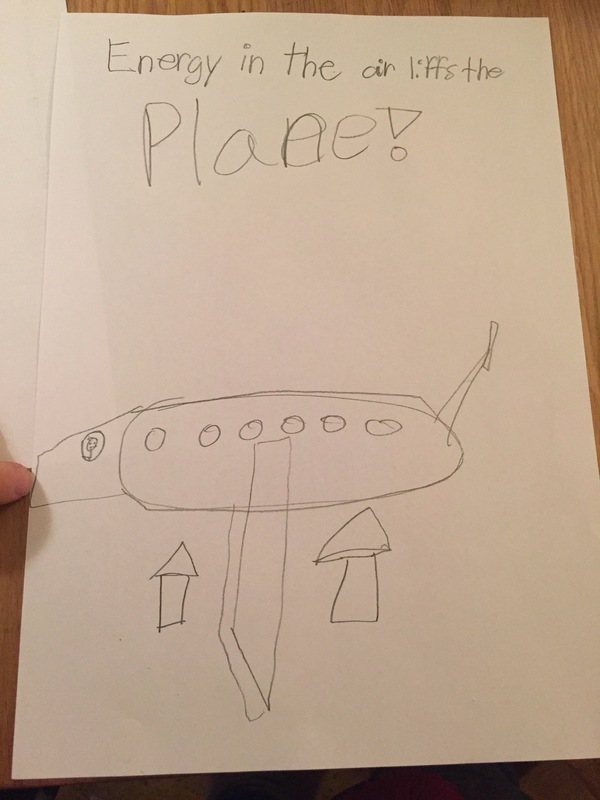 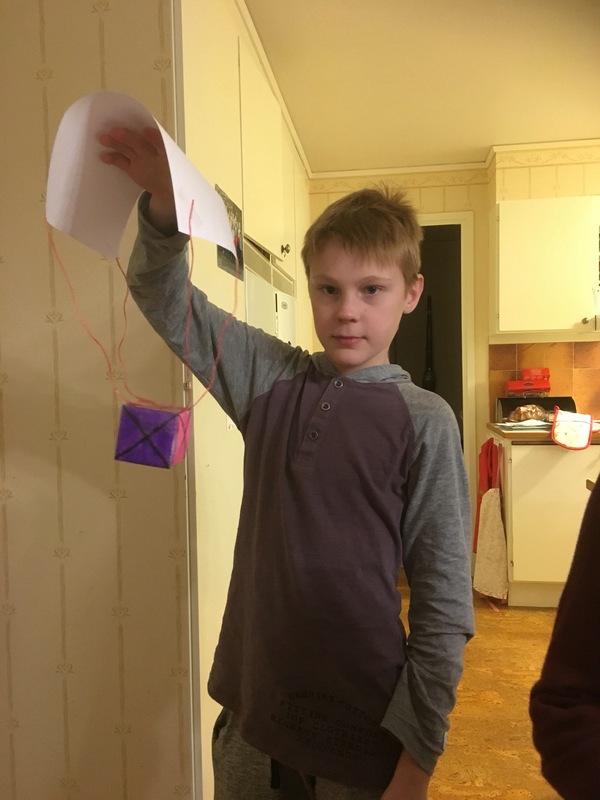 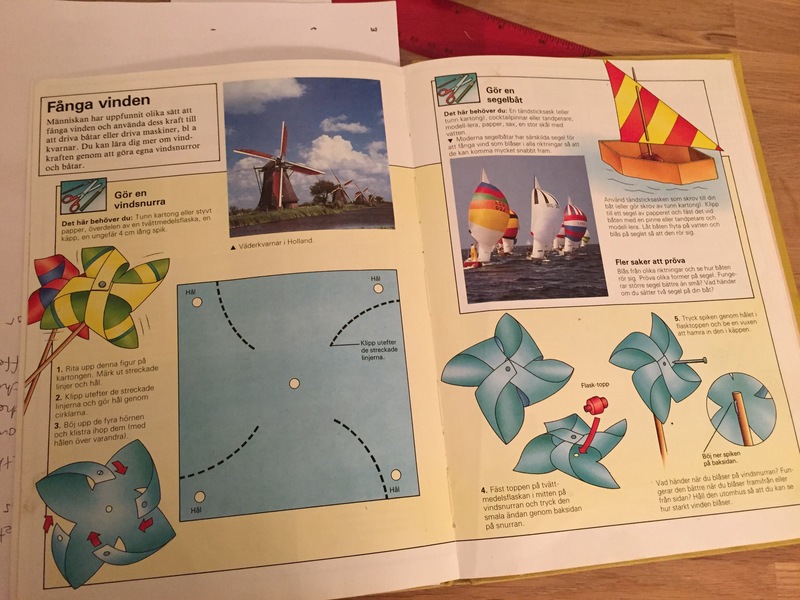 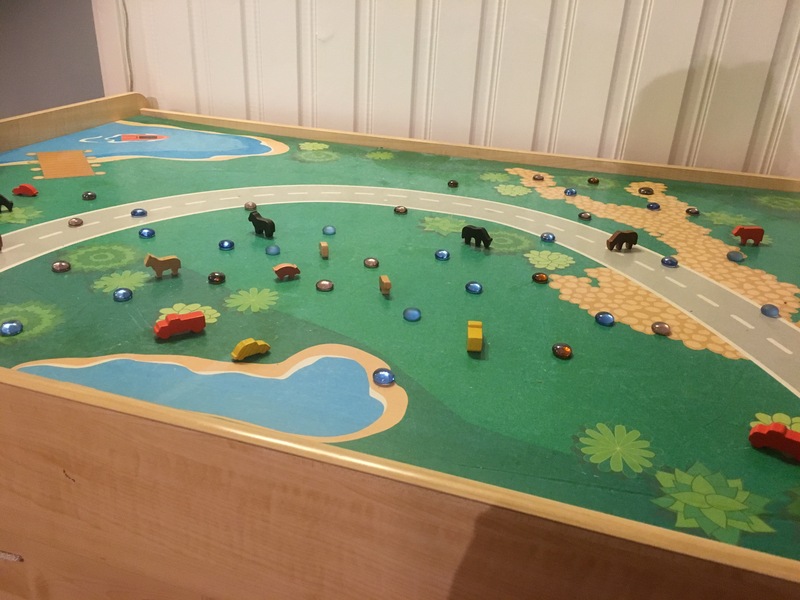 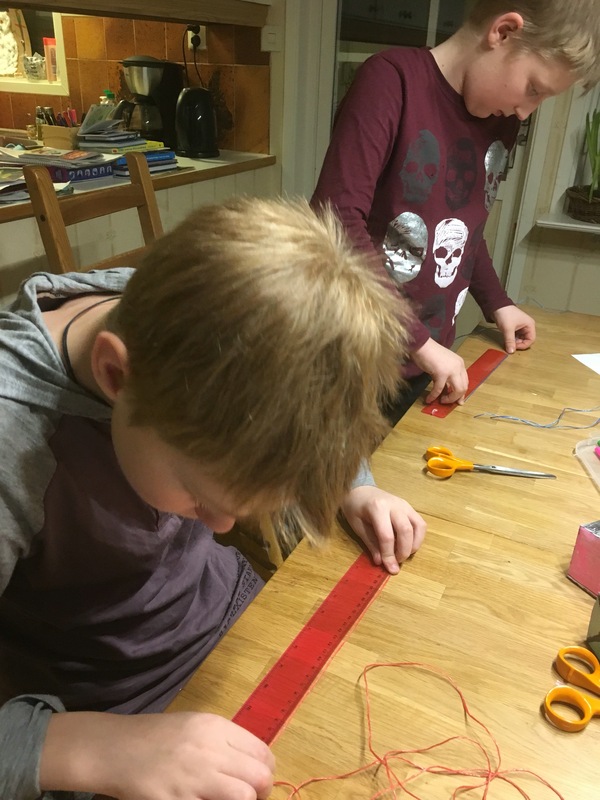 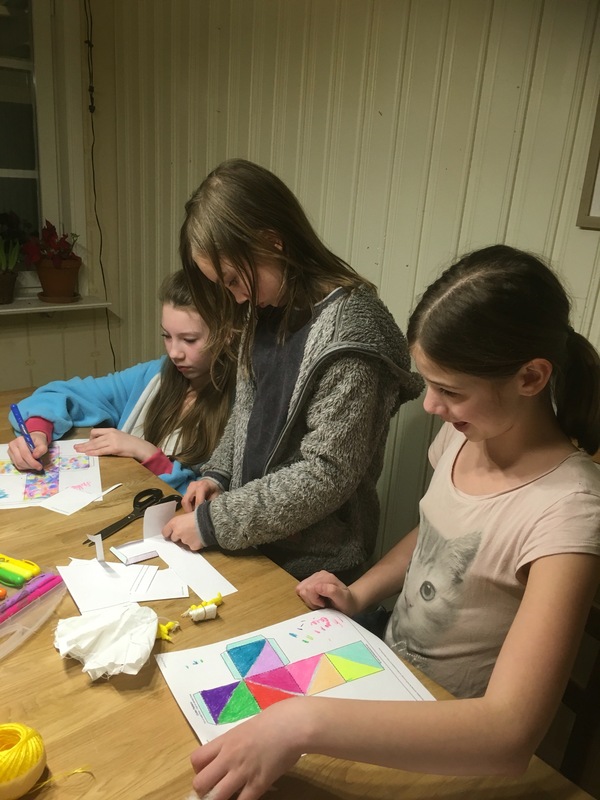 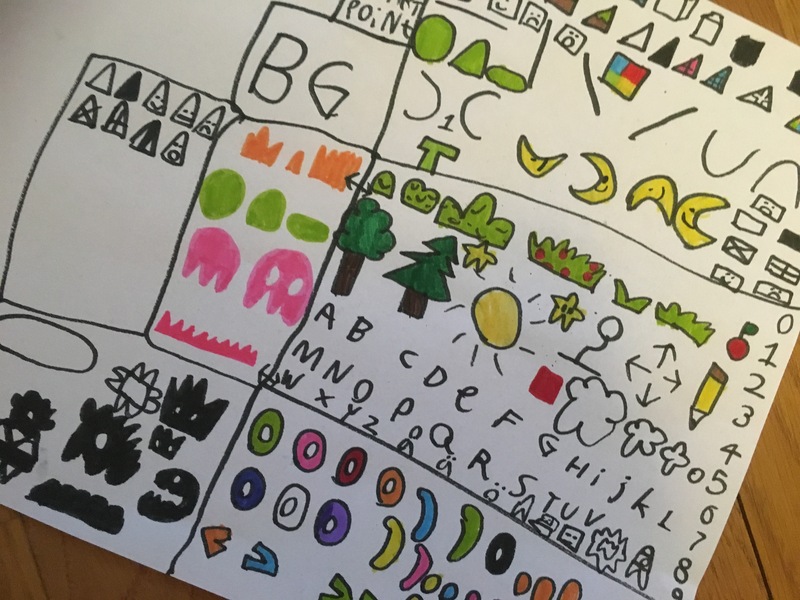 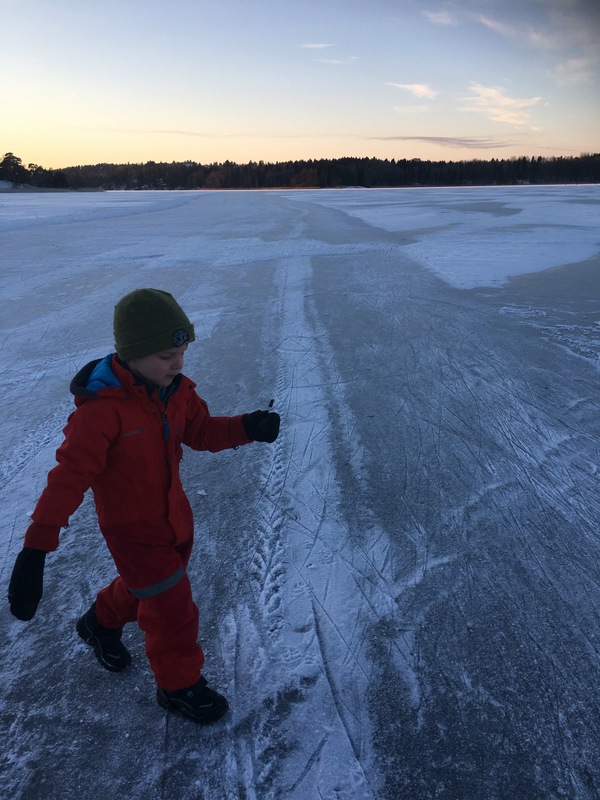 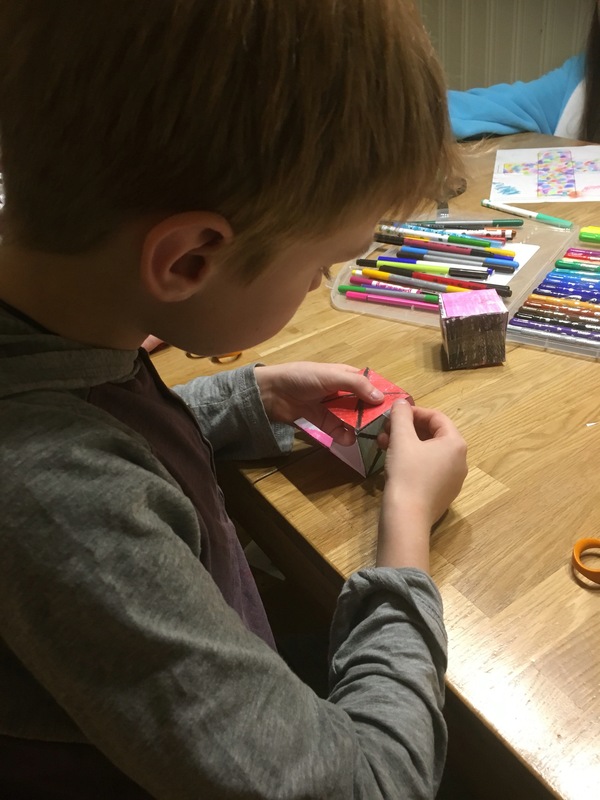 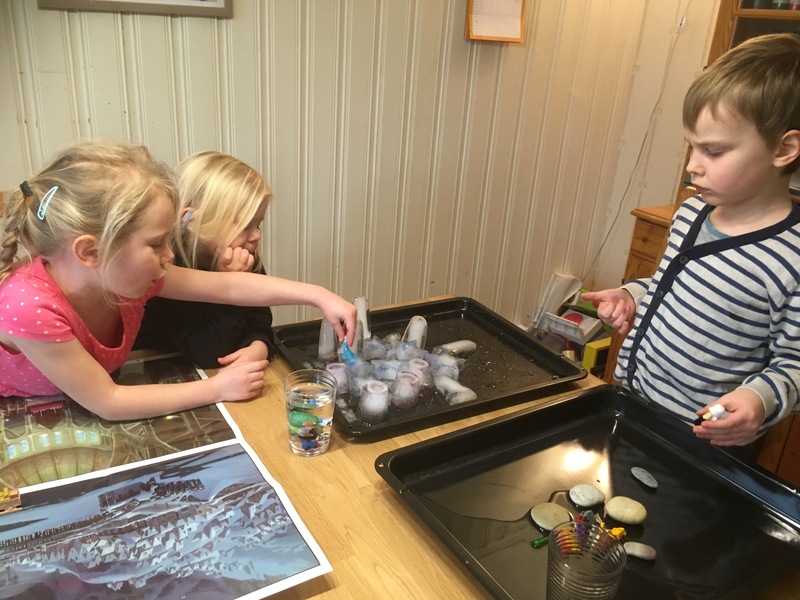 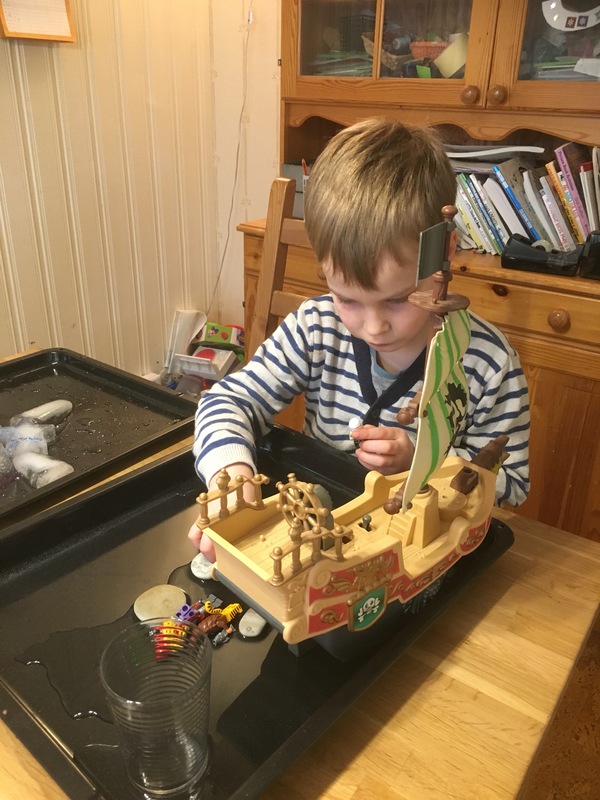 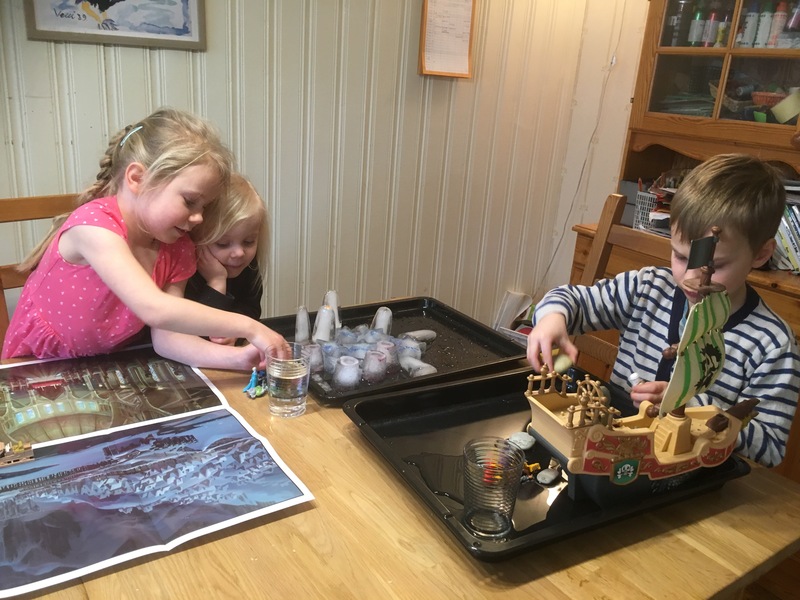 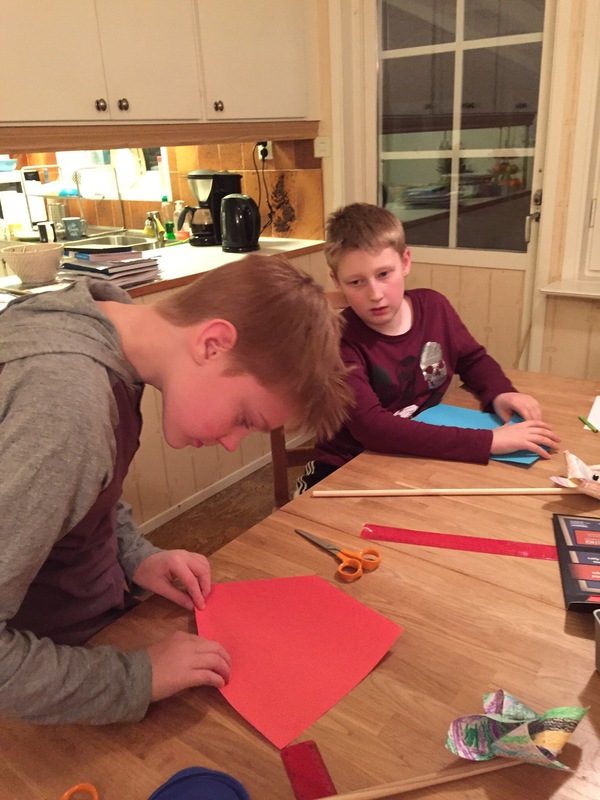 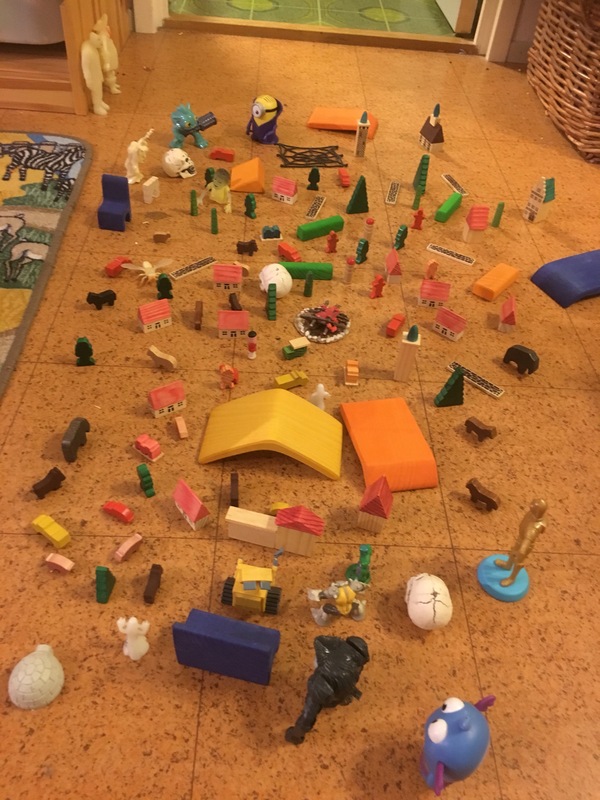 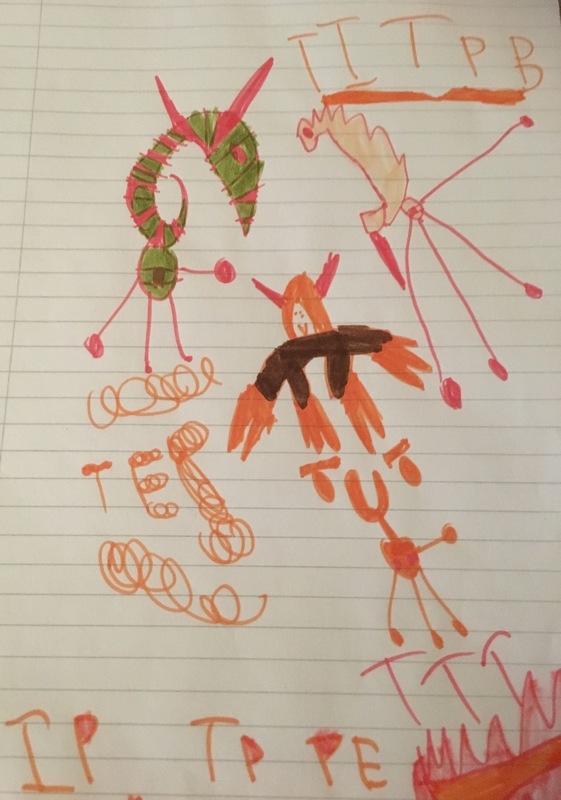 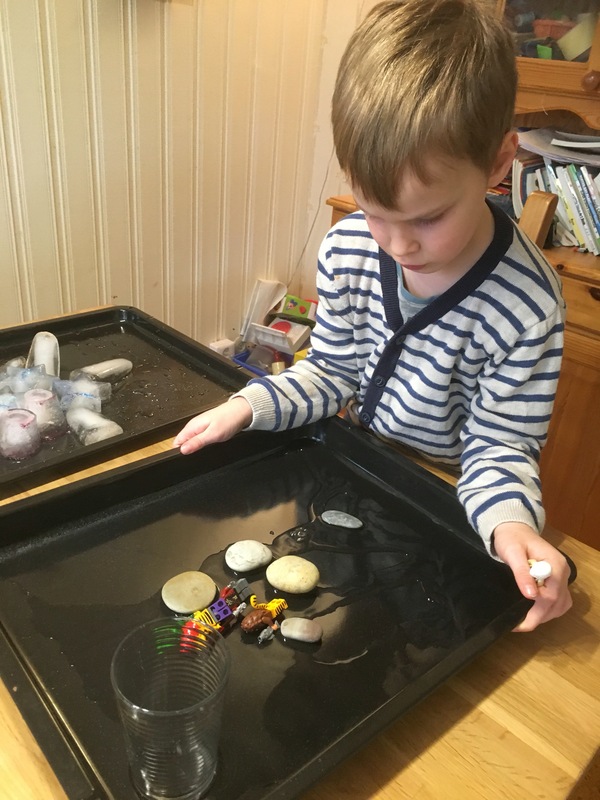 It’s not that I don’t really think he’ll learn them eventually – it’s just that I think he needs just a little ‘nudge’ in the right direction – and I know that, despite it being ‘förskoleklass’ (aka Reception, or Kindergatan), they definately do letters…. 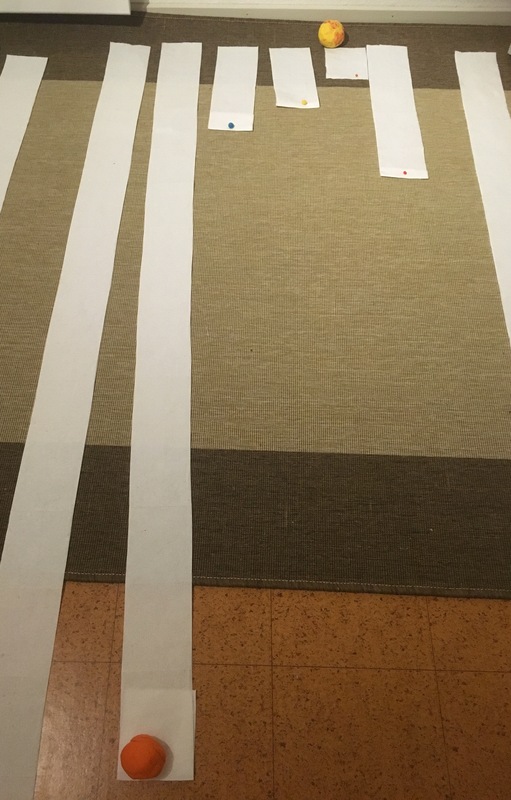 Ted certainly has shown interest in the last six months with letters. 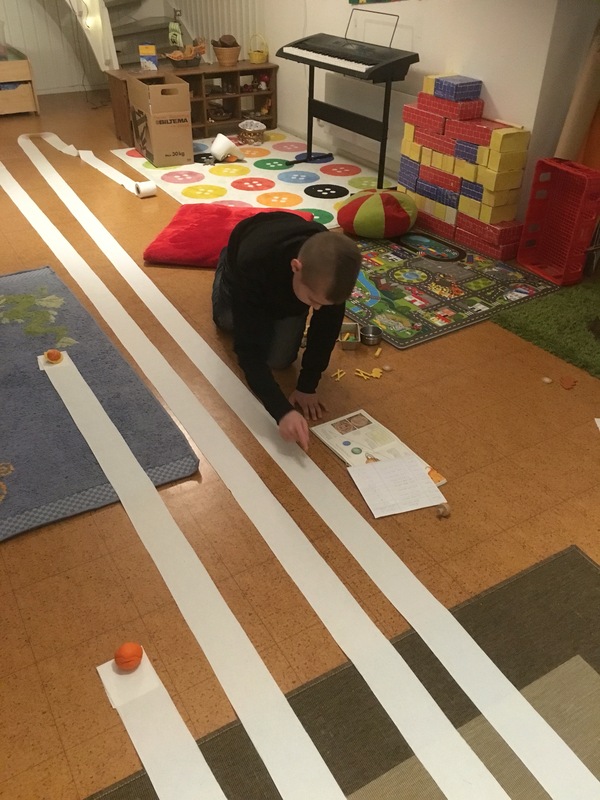 He knows that letters mean ‘reading’ and that you go from left to right in english, and he can recognise and form a handful of letters (mostly always) correctly. 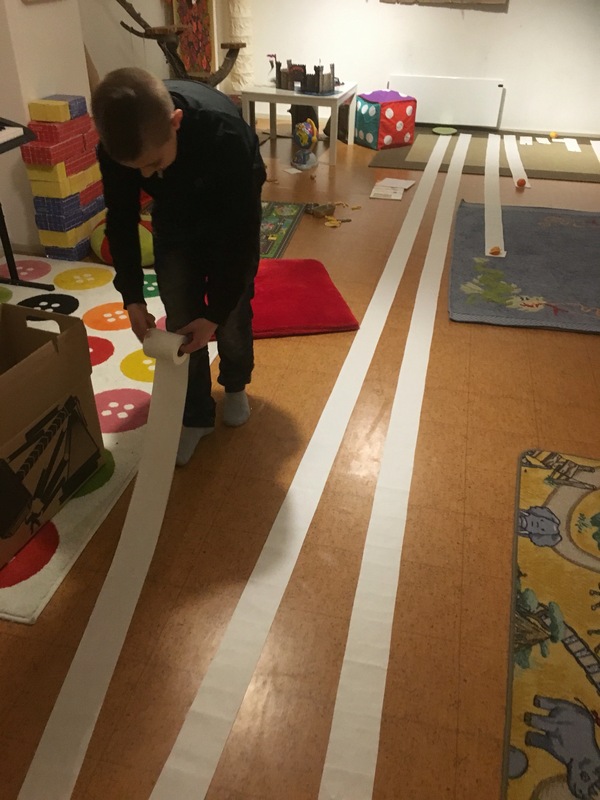 He can also recognise his own name, and knows what letters his families names begin with. 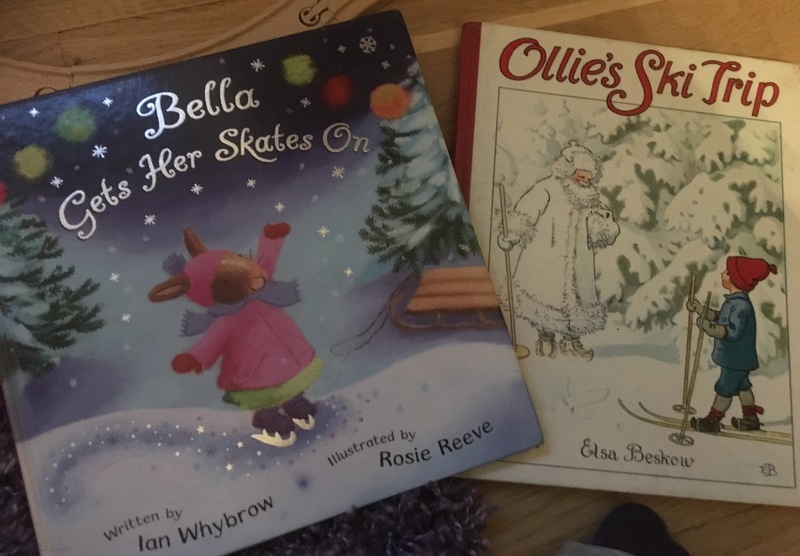 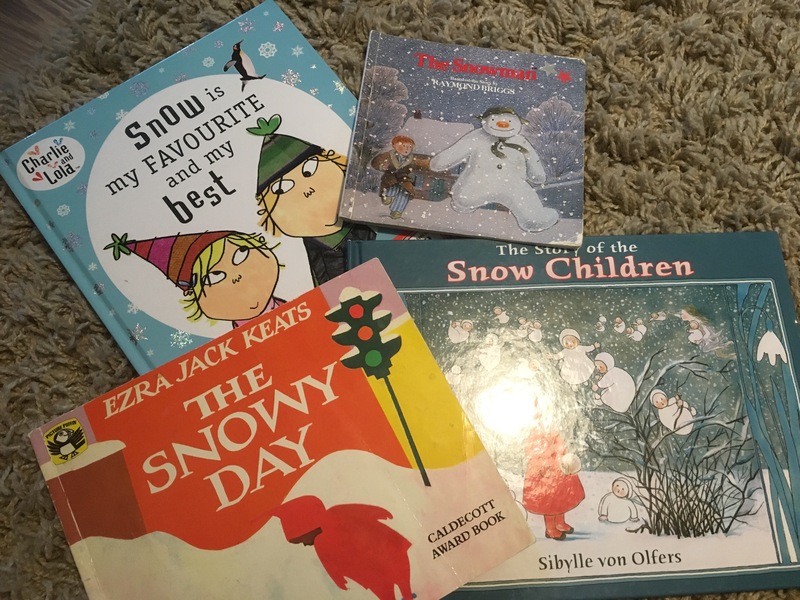 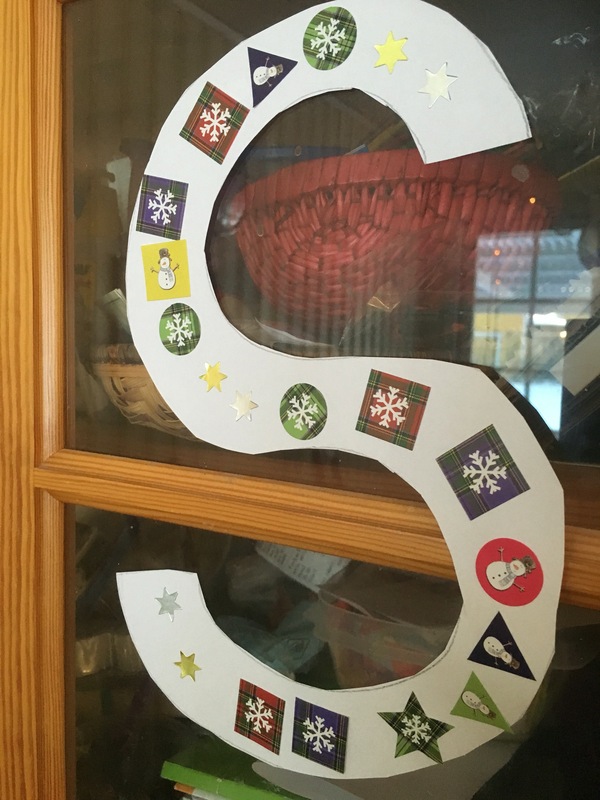 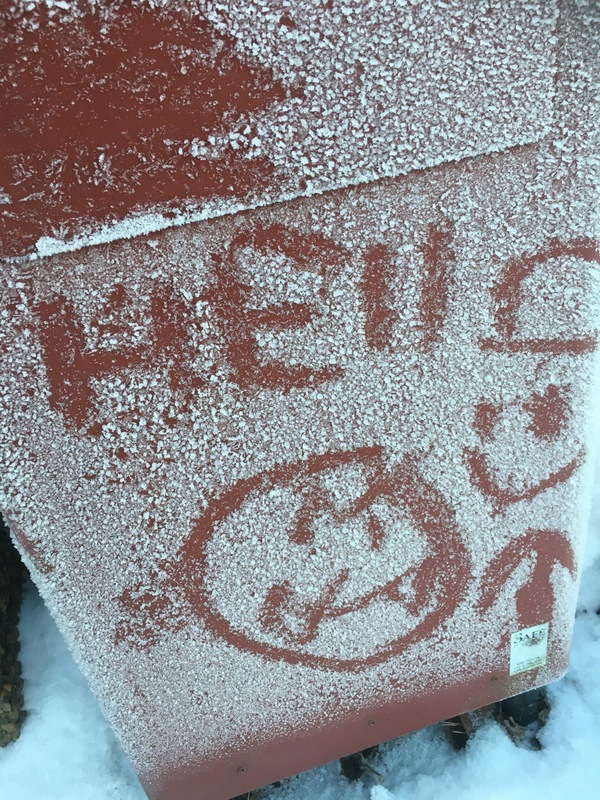 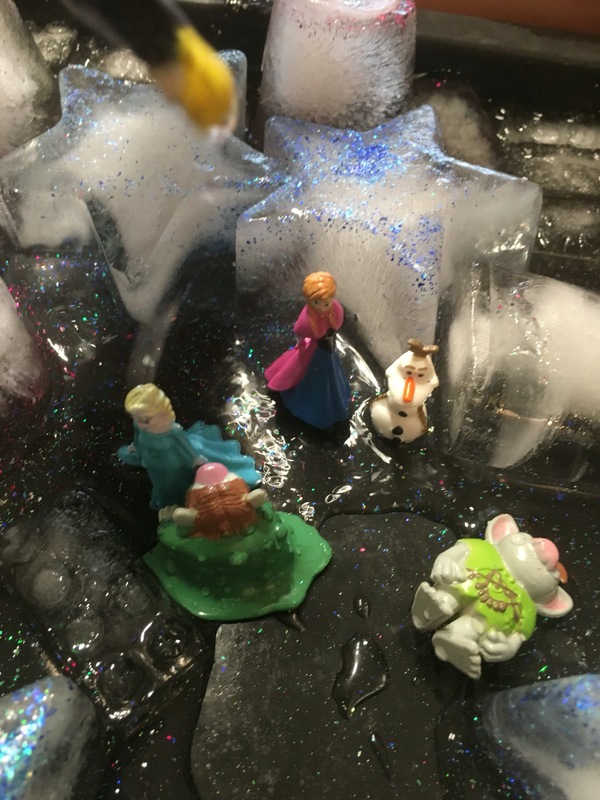 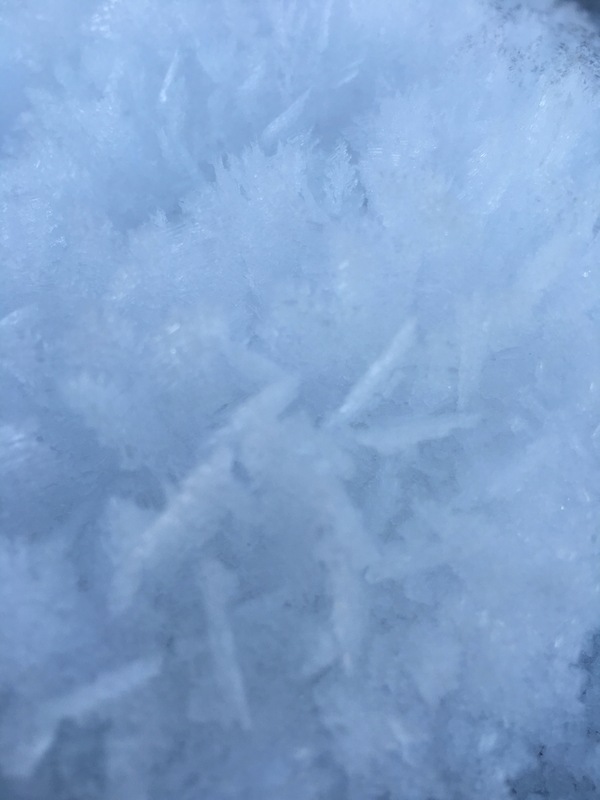 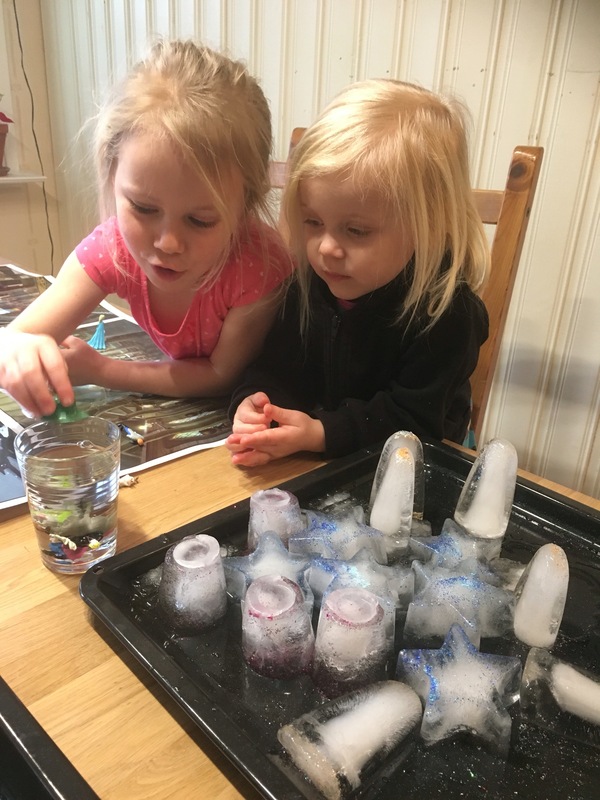 So we started with S. Because S is easy to recognise – being like a wiggly snake – and of course, snow begins with S – and we had lots of that around! 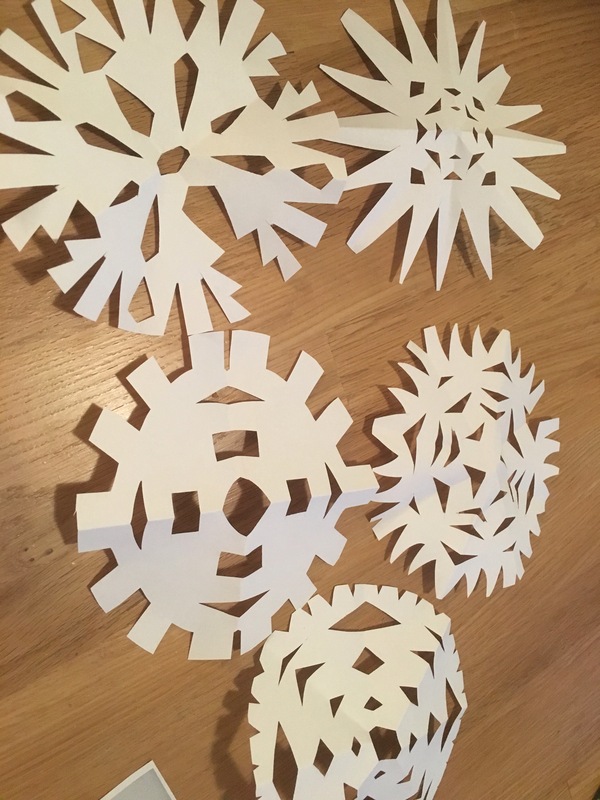 We made SNOWFLAKES from paper (admittedly mostly me! 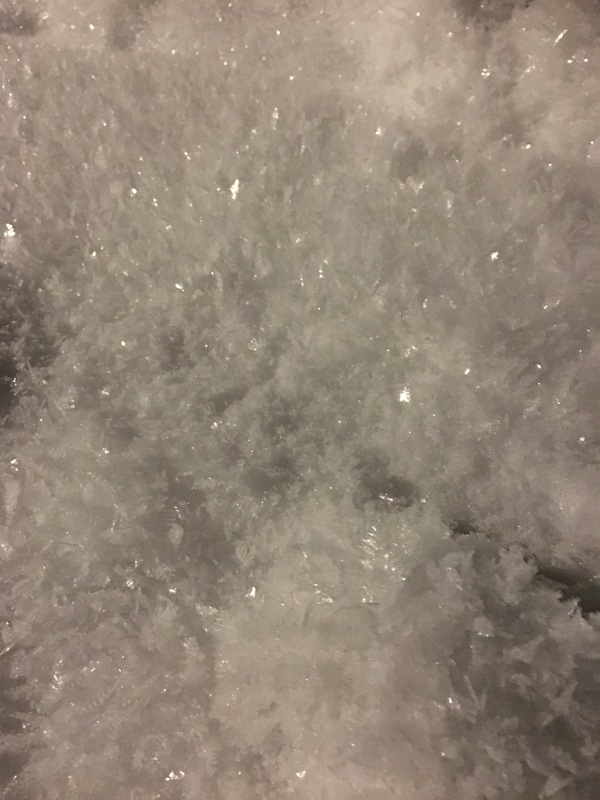 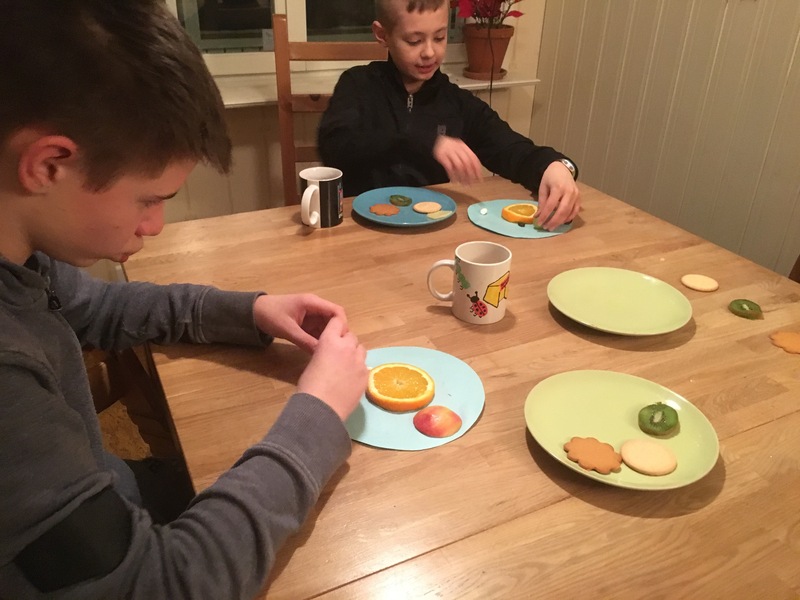 😂)…..
…and marshmallow crispy SNOWMEN (which I unfortunately forgot to photo). 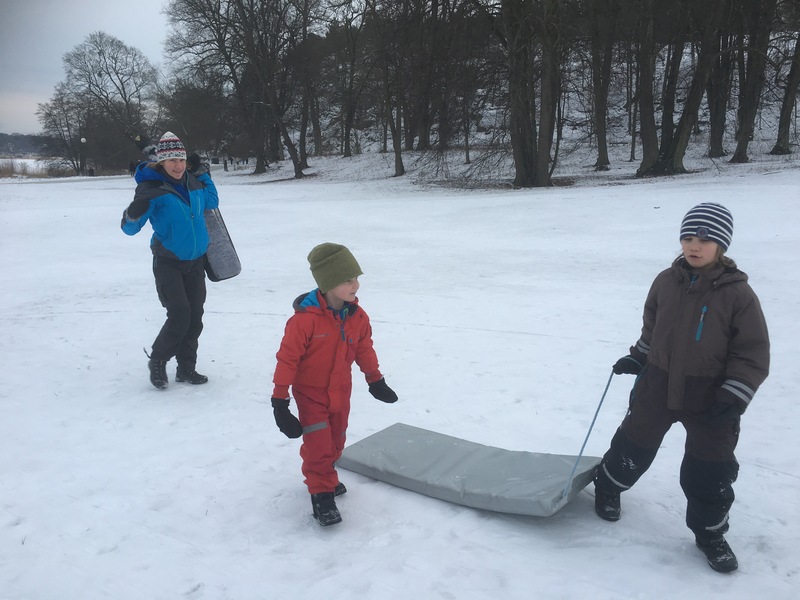 We have of course already been SLEDGING… …and SKATING and SLIDING on the ice…. 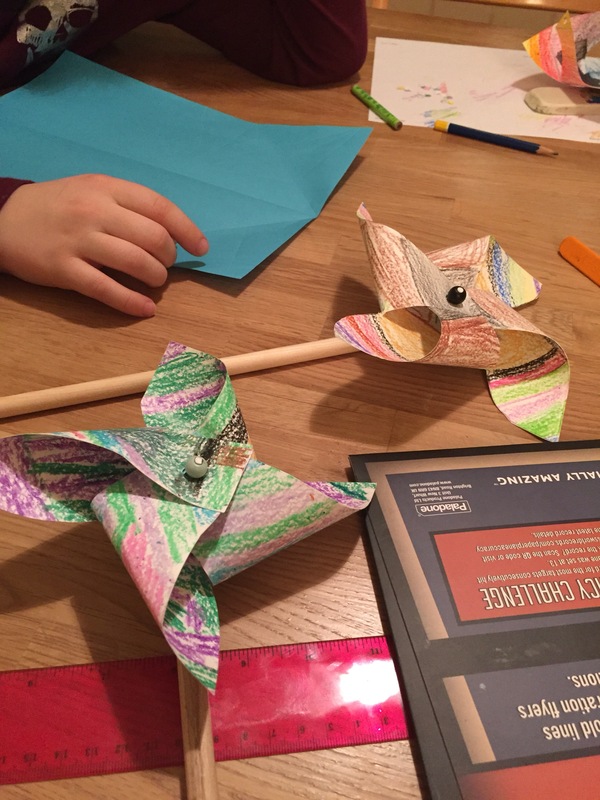 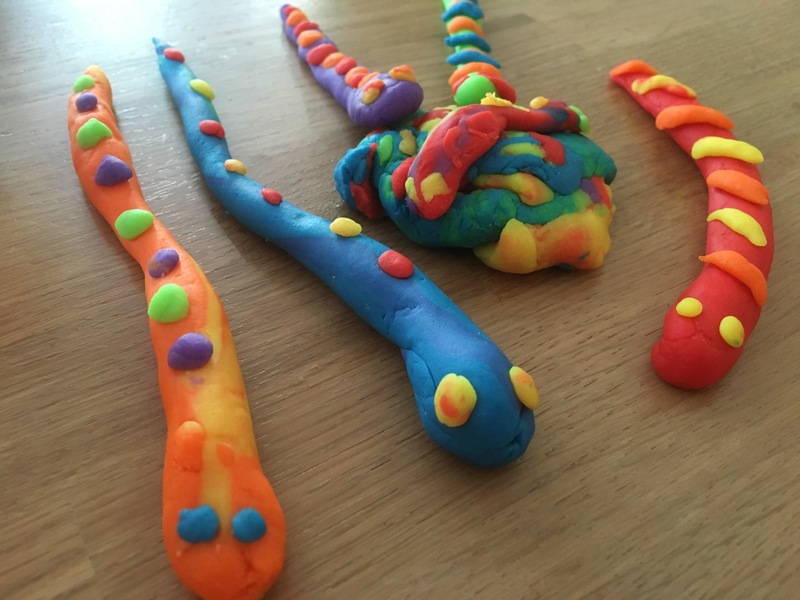 …and reading books about things like that too… We also made SNAKES from plastercine…. 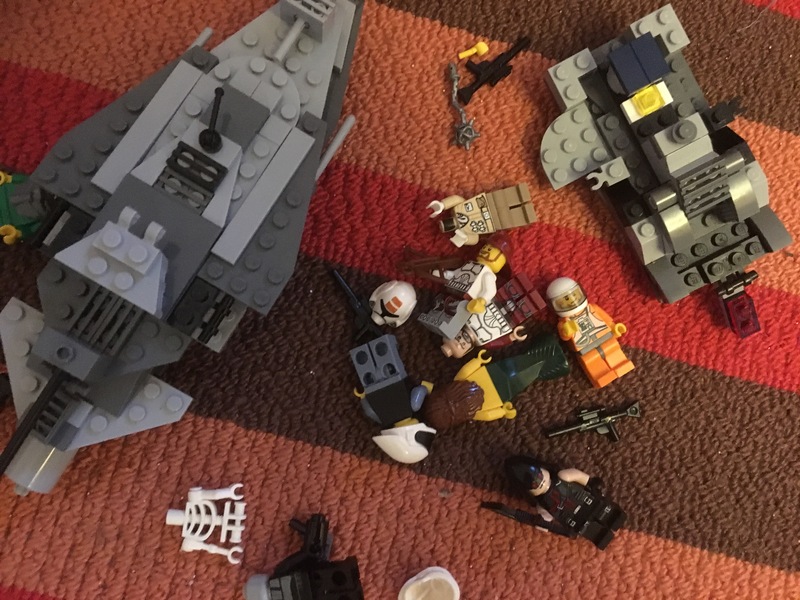 ….ate SAUSAGES and SPAGHETTI, and continued STAR WARS lego play with Alfie….. 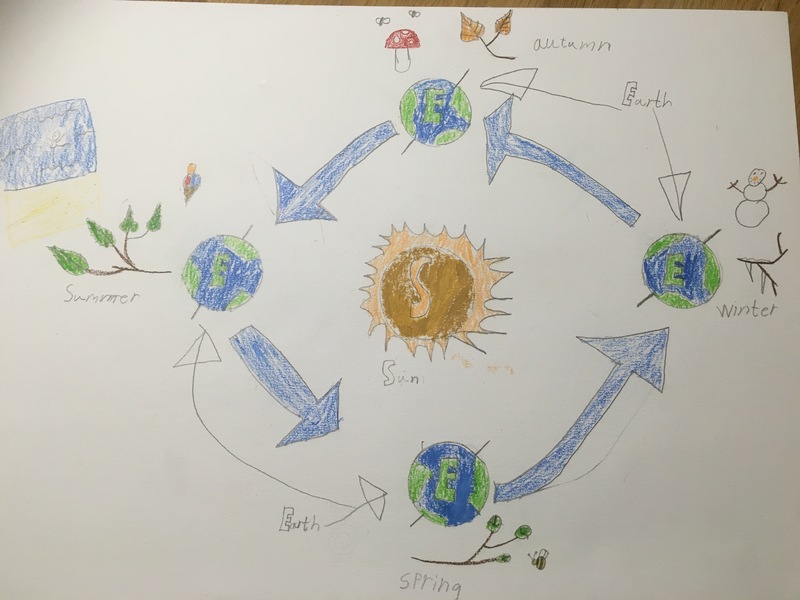 Yesterday we tackled the basics of the sun, and its relation to Earth. 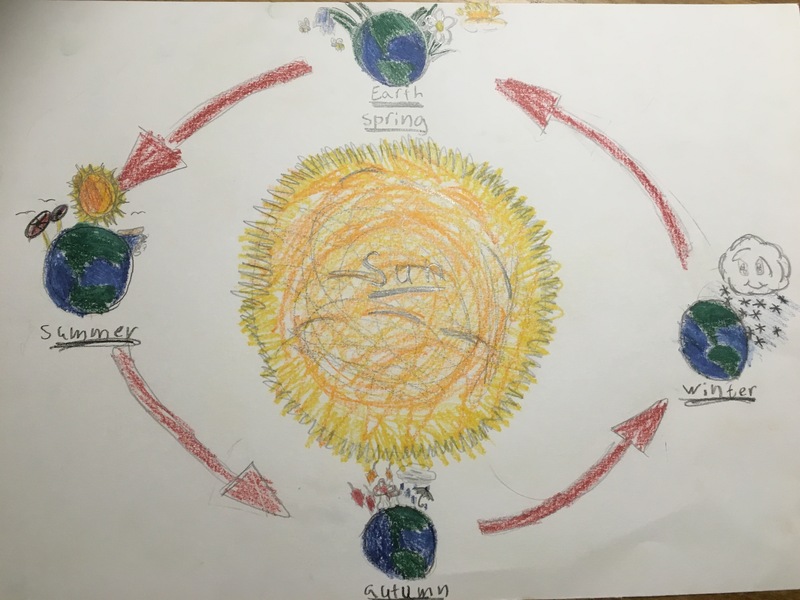 And we talked about how the sun creates our seasons, and I challenged the kids to make a poster explaining this to a ‘young child’…. 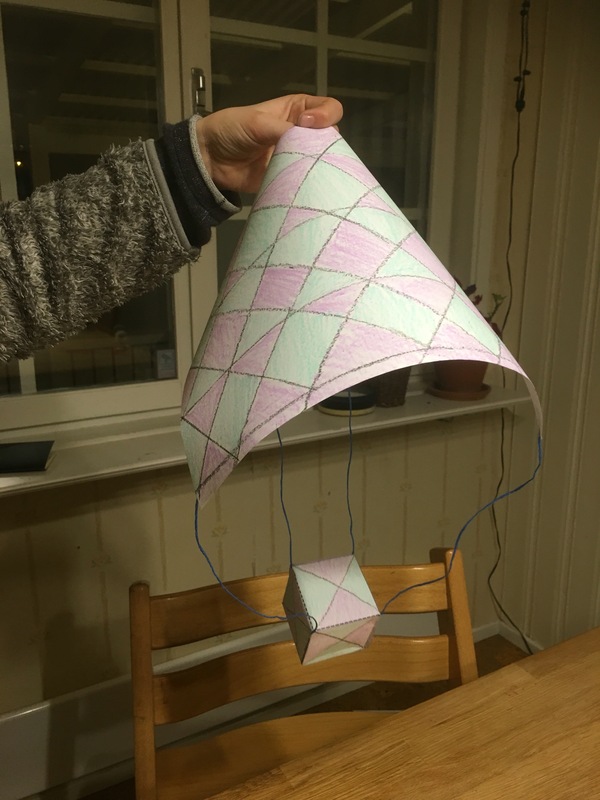 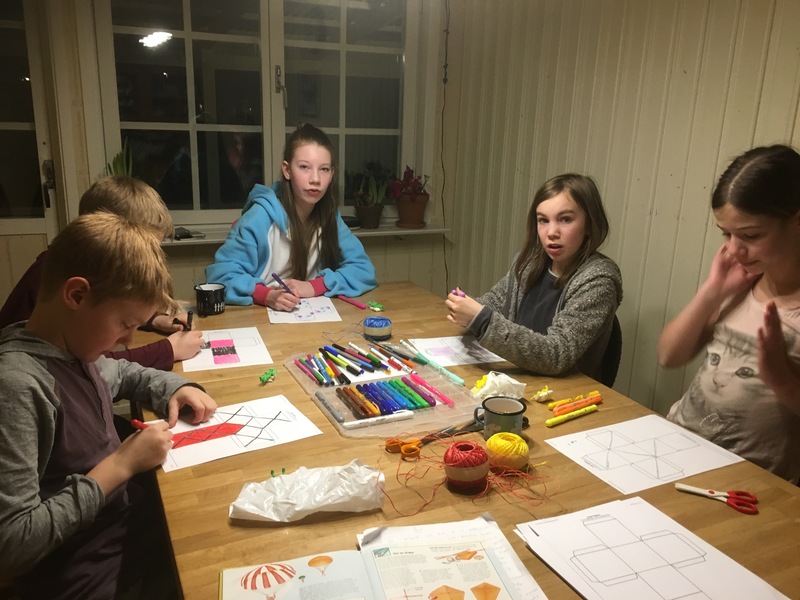 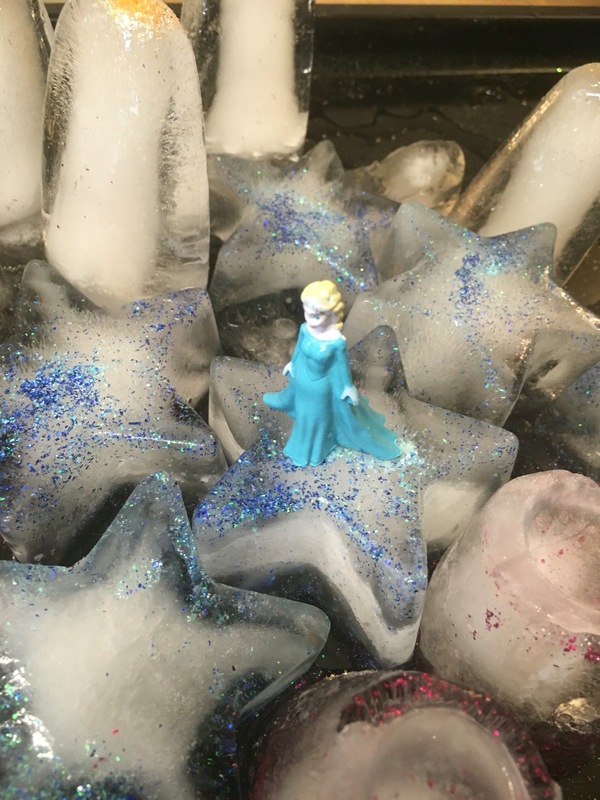 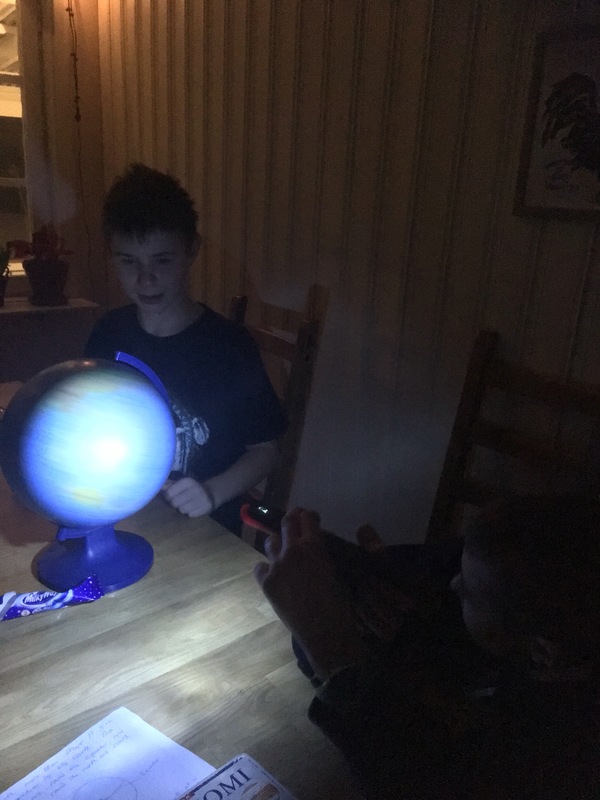 …and we talked a little about our sun being a star, and the different stars in the sky, and how they have different colours because of their different temperatures – and we observed the flame of a candle to experience how the blue light is the hottest, etc. 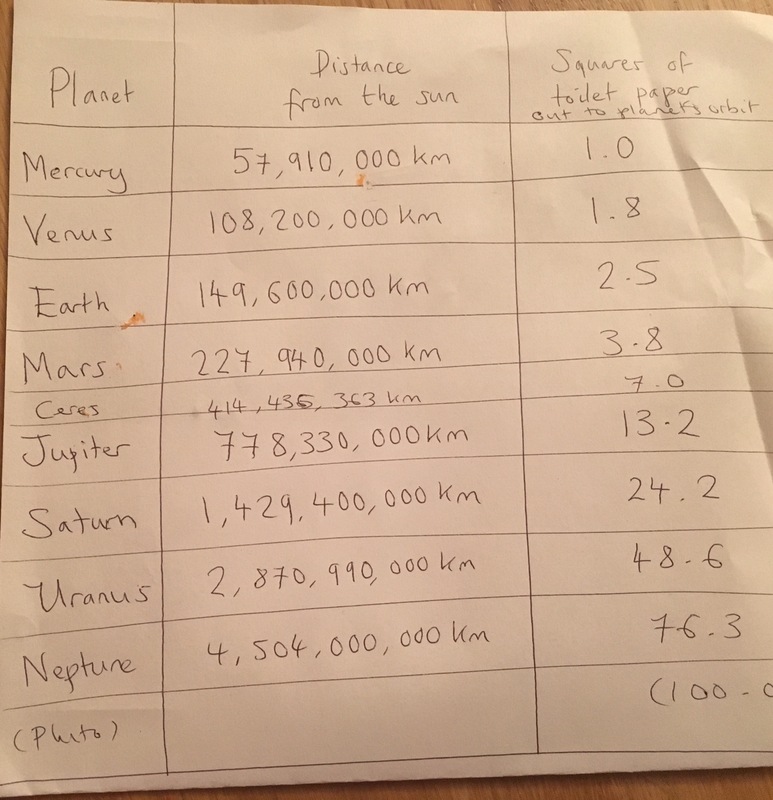 We will do more on stars next week. 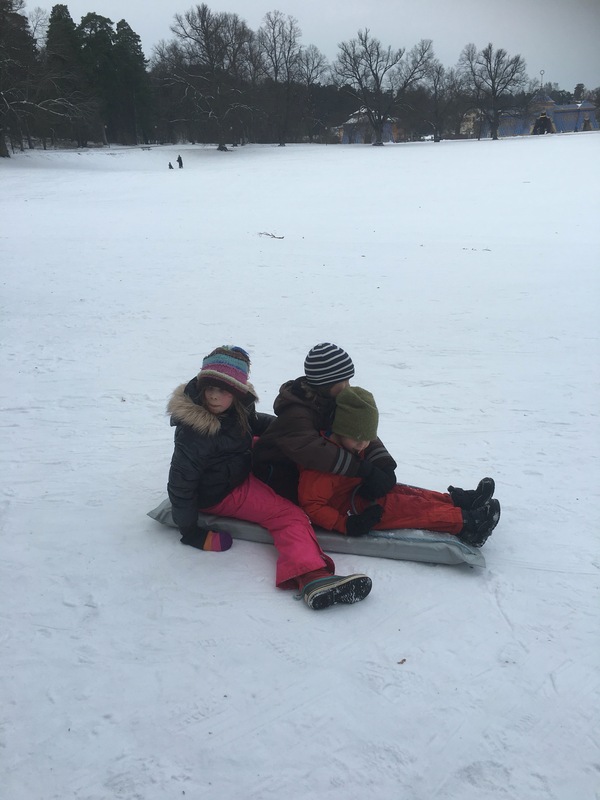 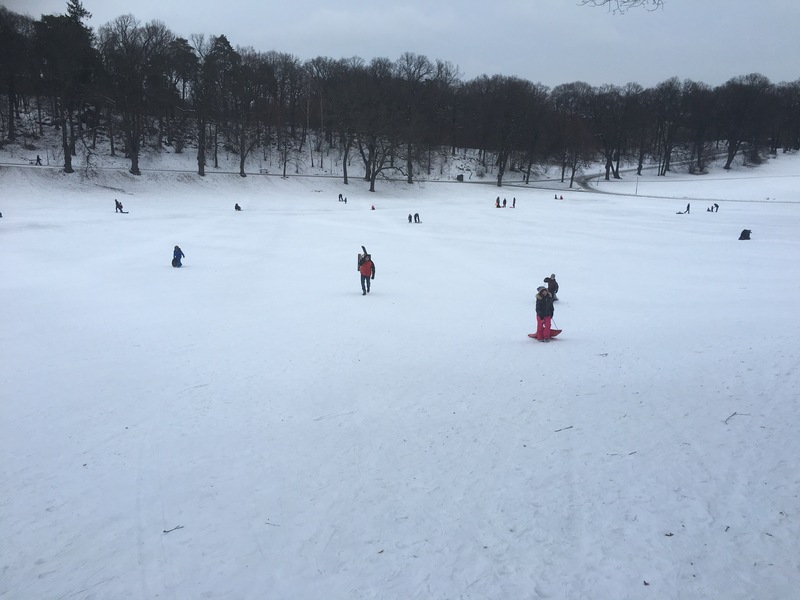 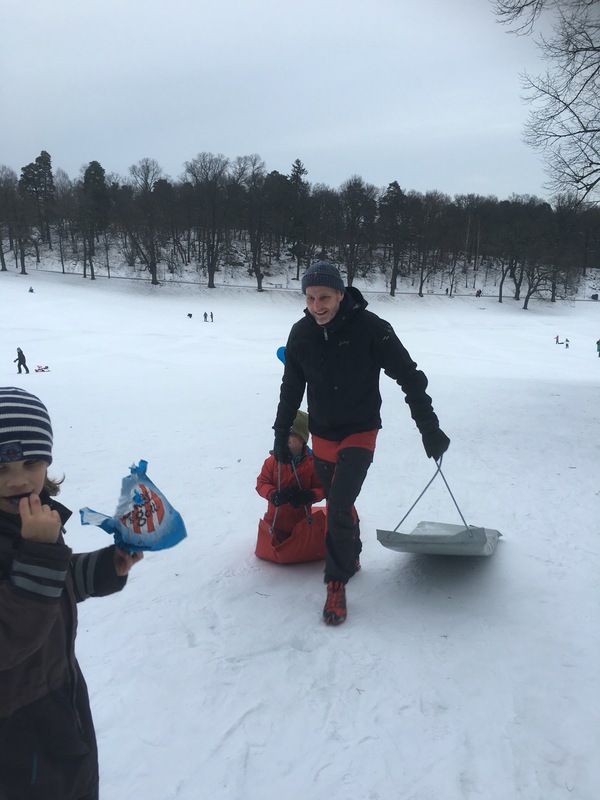 At the weekend we met up with some old friends, Lotta and Per, and went sledging with them in Haga park…. 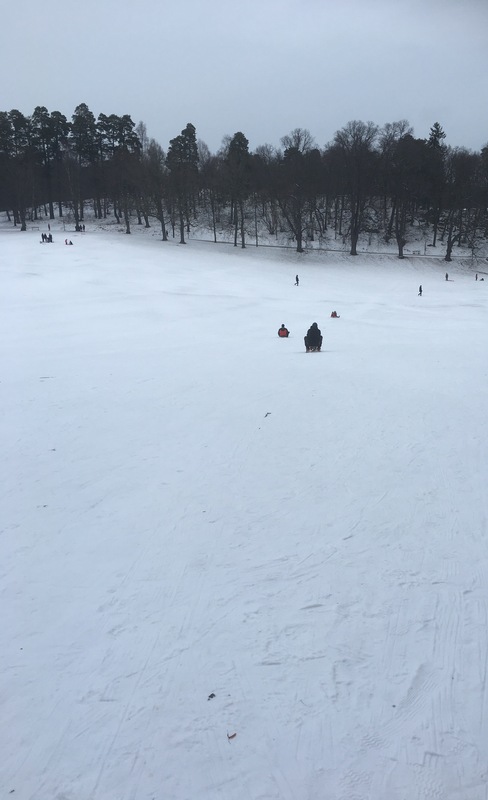 As you can tell, it wasn’t a sunny day! 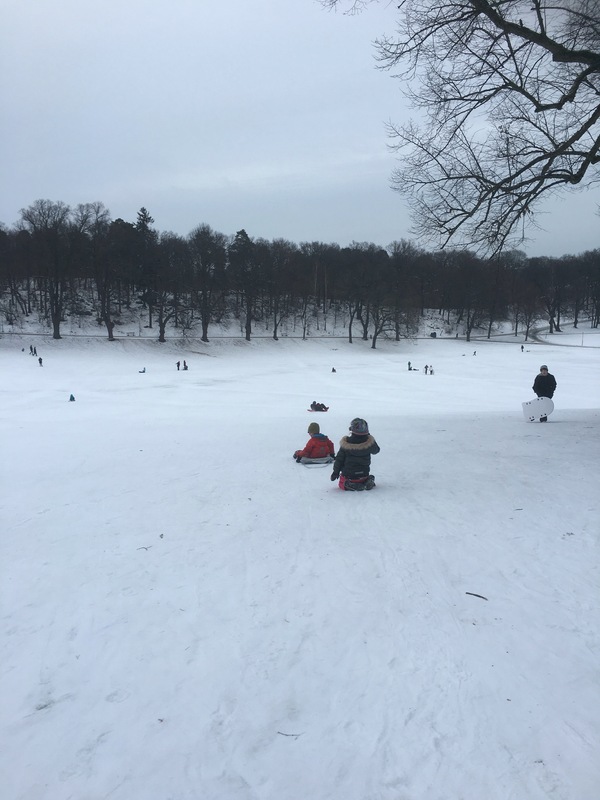 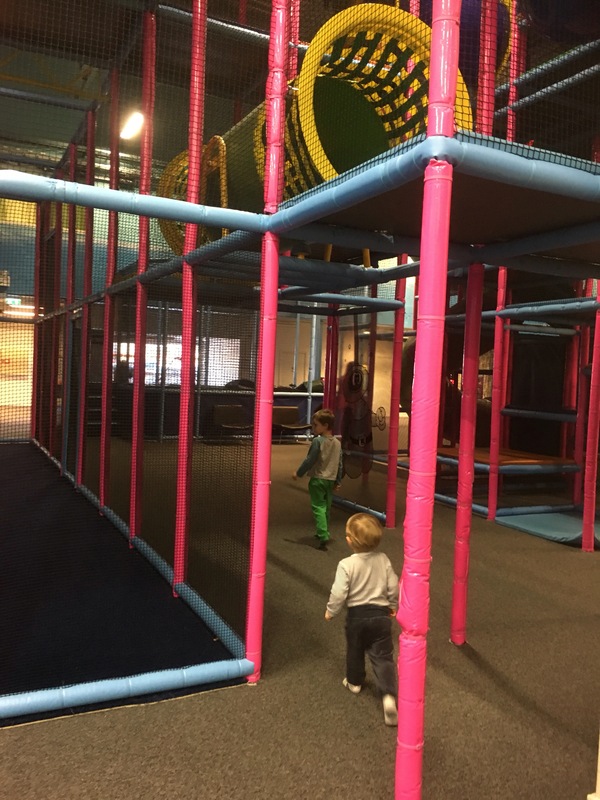 But fun it was – and this park is great to sledge in as the hills are long, but not too steep. 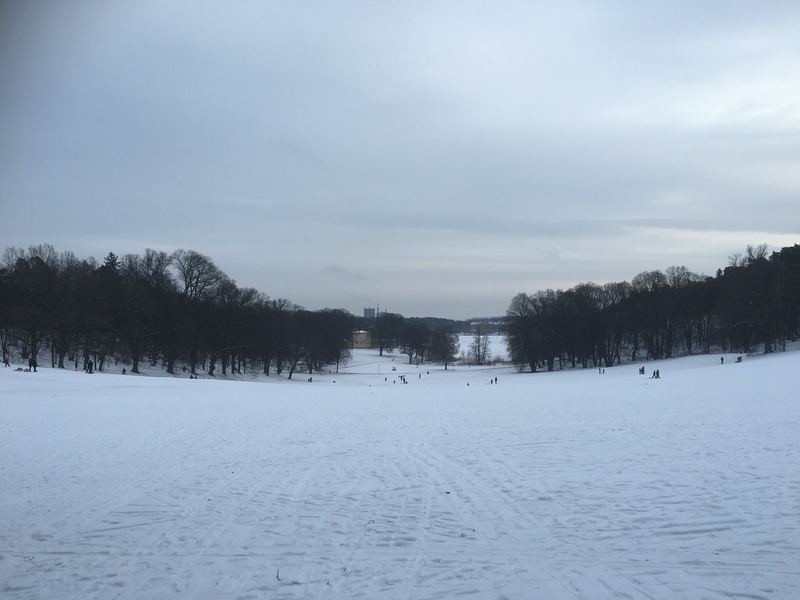 This is actually known as ‘The King’s Park’ because it does infact belong to the Swedish royal family – but the public are welcome to use it. 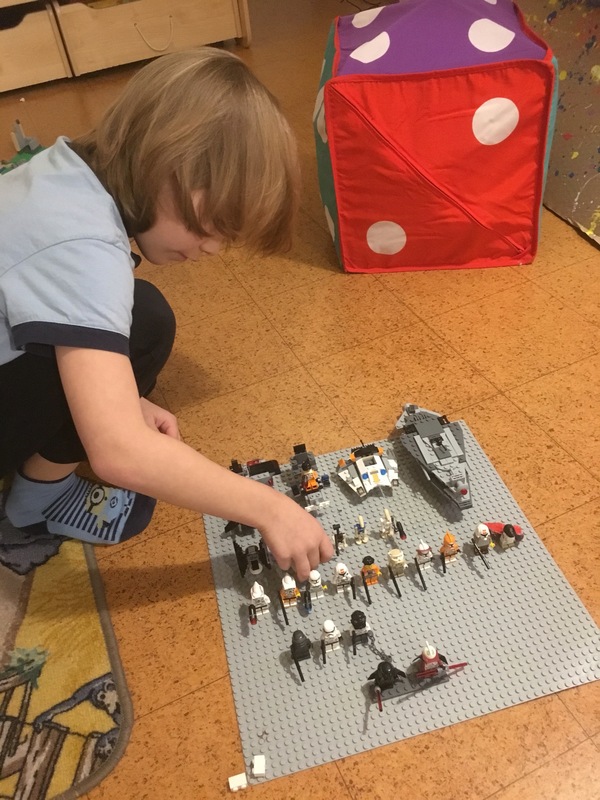 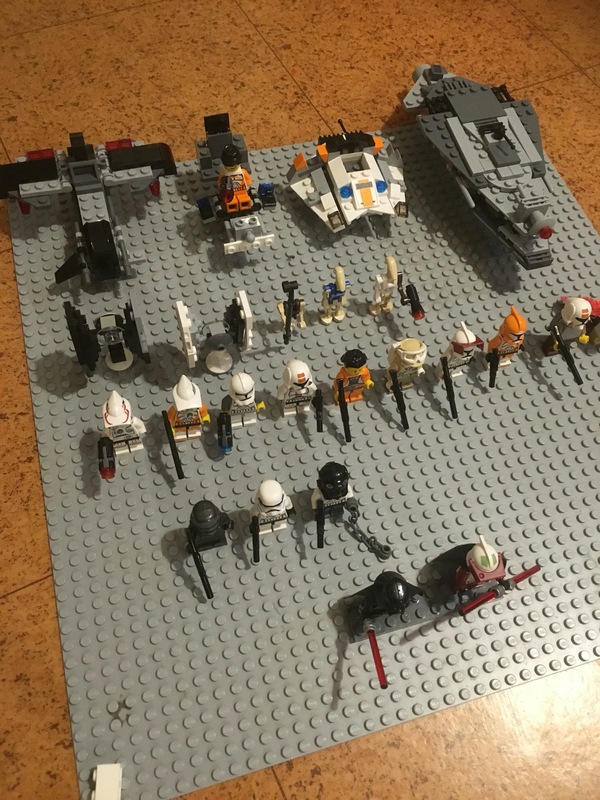 Alfie started at ‘Star Wars Club’ at school this week, which he thought was absolutely brilliant! 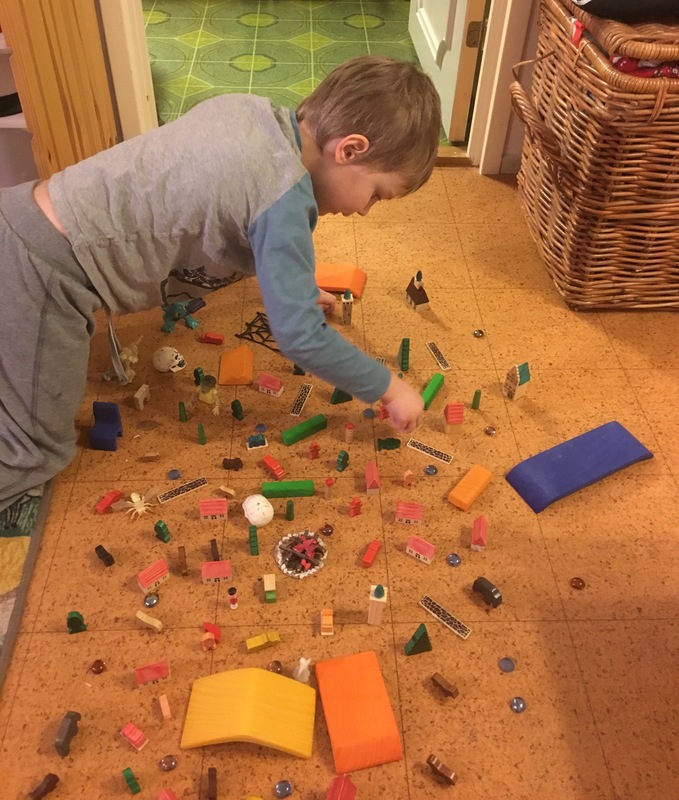 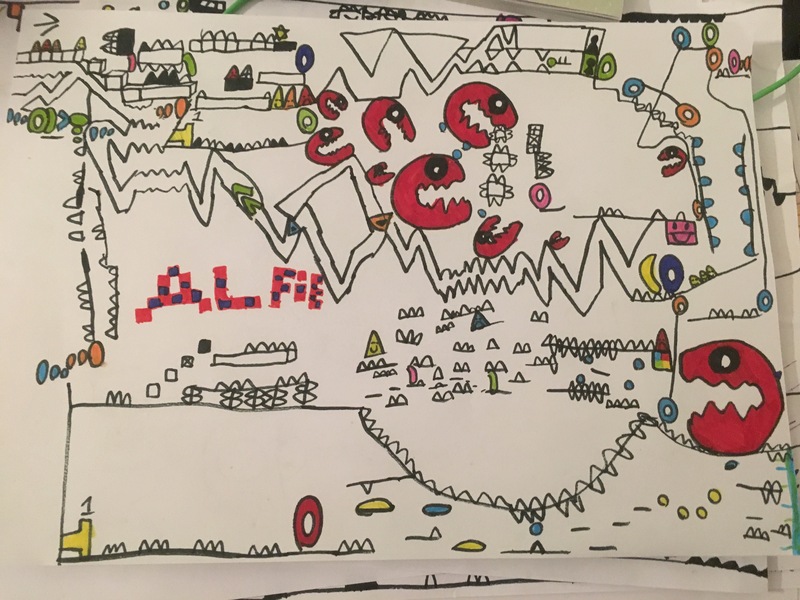 This has inspired a lot of lego Star Wars play, along with Ted…..
And as always, Alfie has had lots of friends to play! 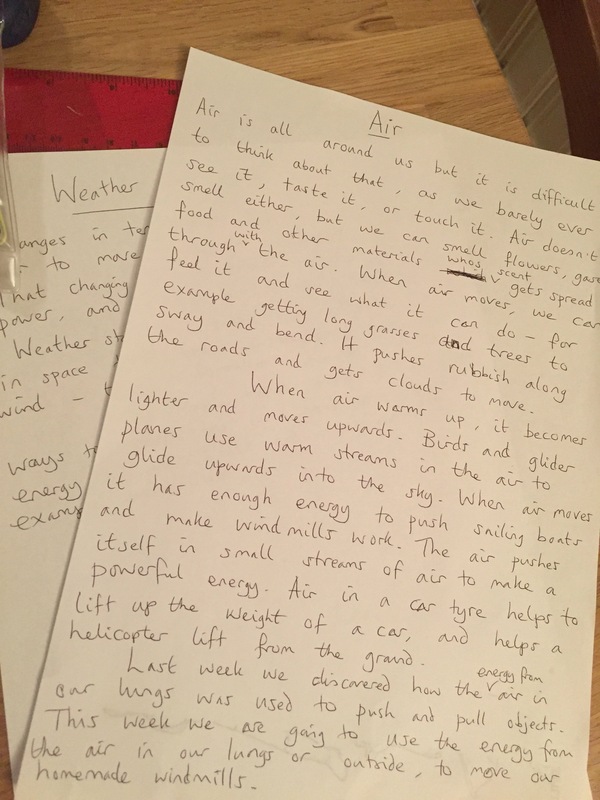 We talked about air ; how we know it’s there, how it reacts and why, and how we use it. 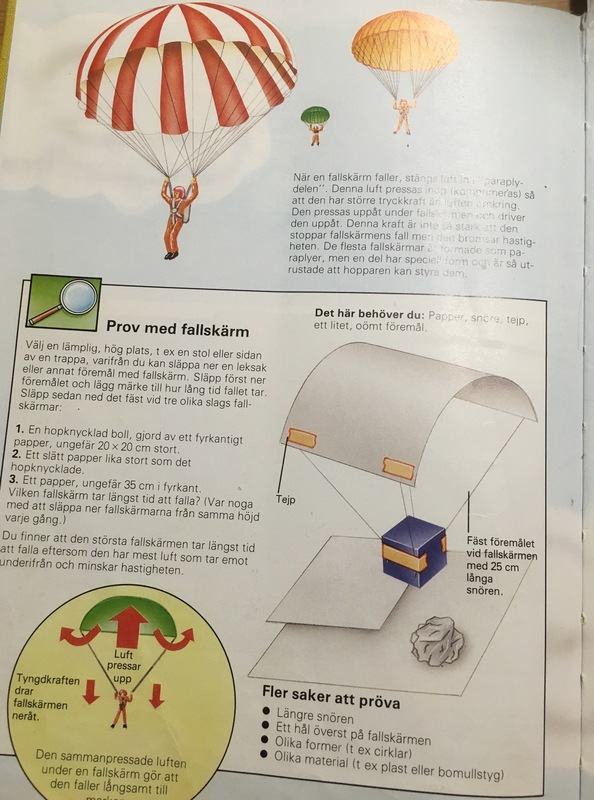 If I don’t have any books on the subject in English, I translate for myself and write it down – good for my Swedish too! 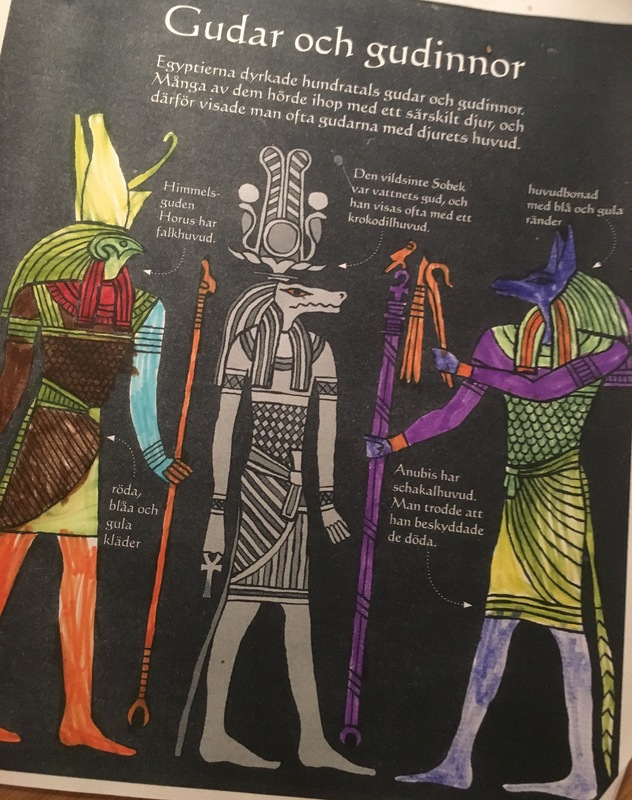 I then read this out to the children, translating where neccassery and asking questions to make sure they are understanding. 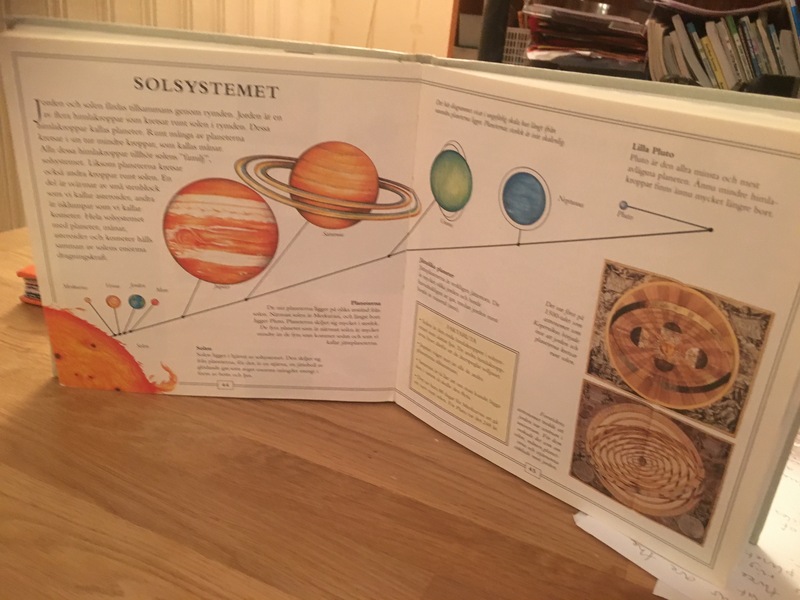 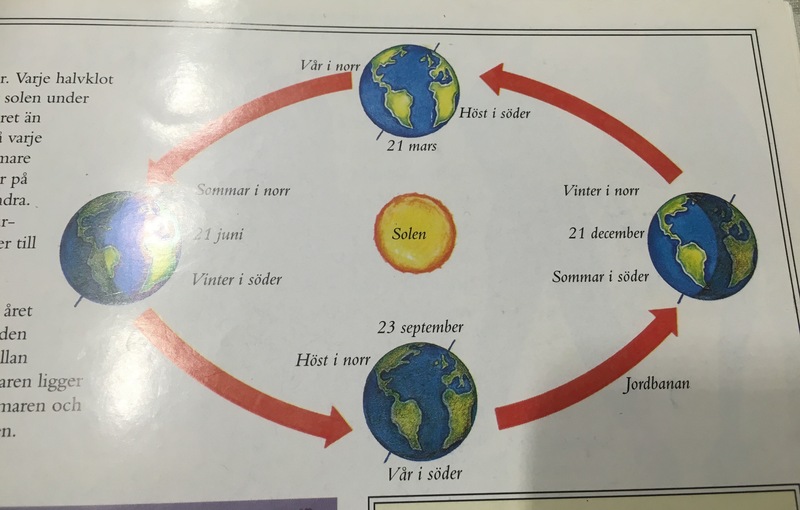 I used a book with a chart of the solar system in it for the children to use visually, while I read a description to the kids about each planet – the size in relation to eachother, where the planet lies in relation to the sun, what materials each planet is made up of, and how each planet looks. 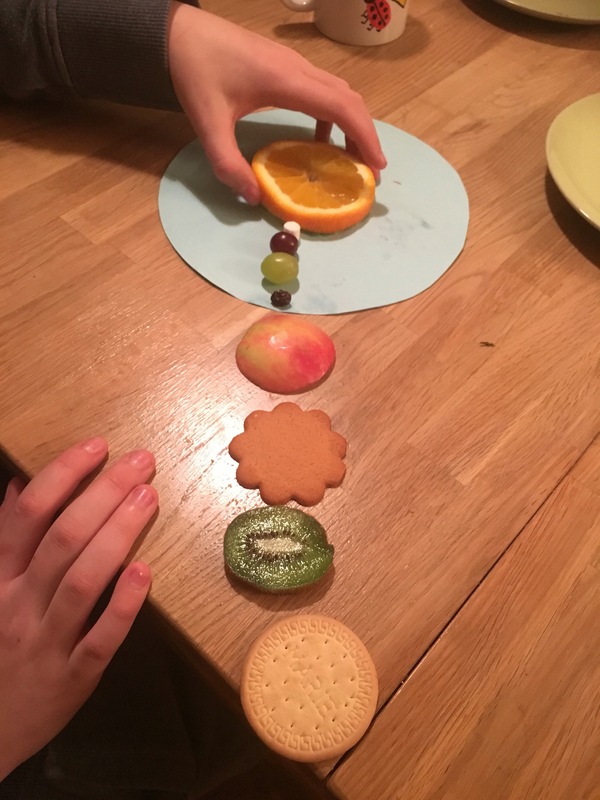 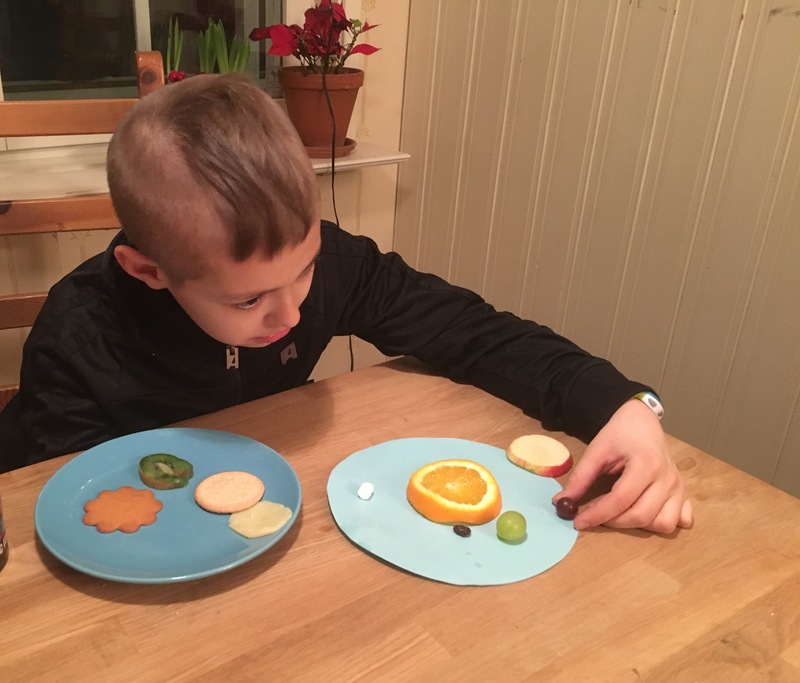 Using fruits and food pieces, the kids tried to make our solar system, according to how the planets are in relation to the sun (the orange slice)…. 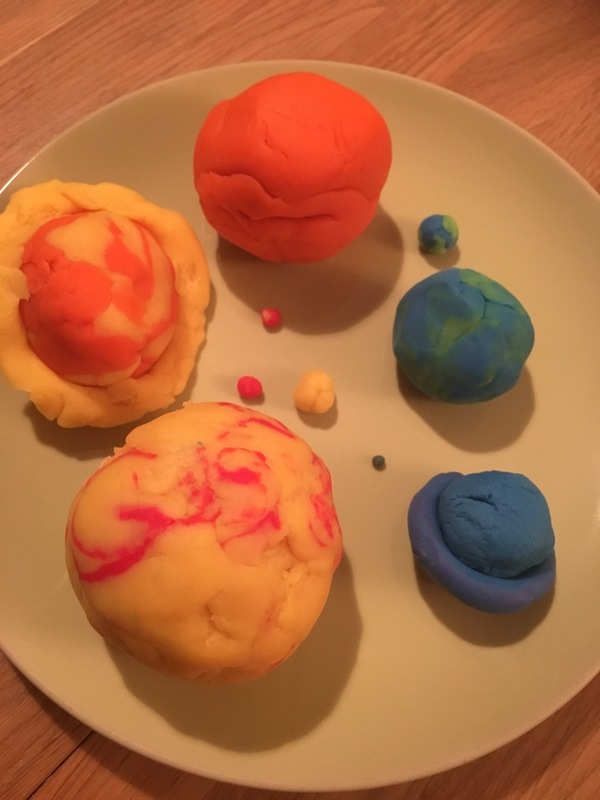 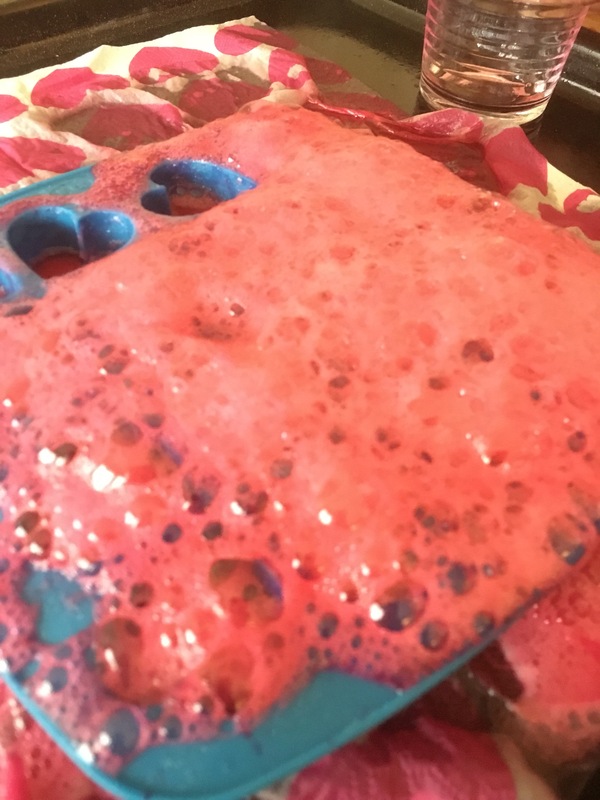 We then went on to use playdough to form our planets – the size they were in relation to eachother, and how each planet looked…. 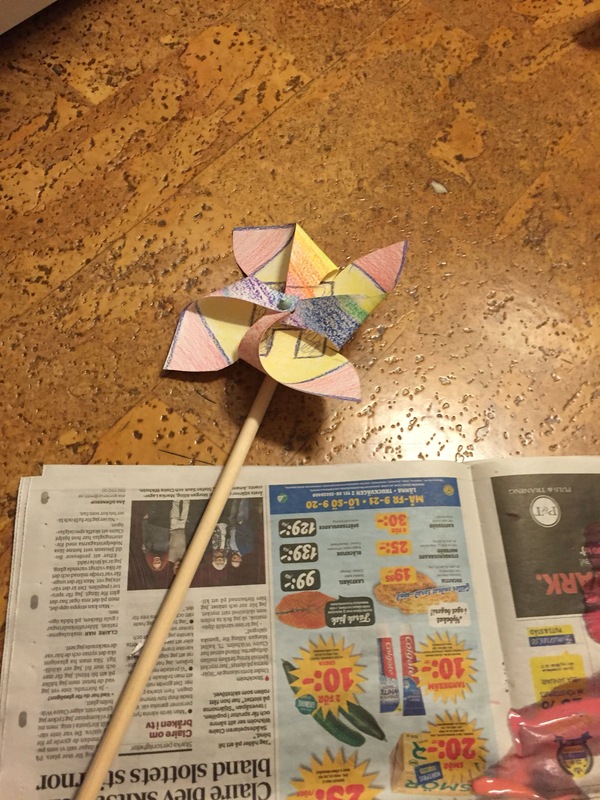 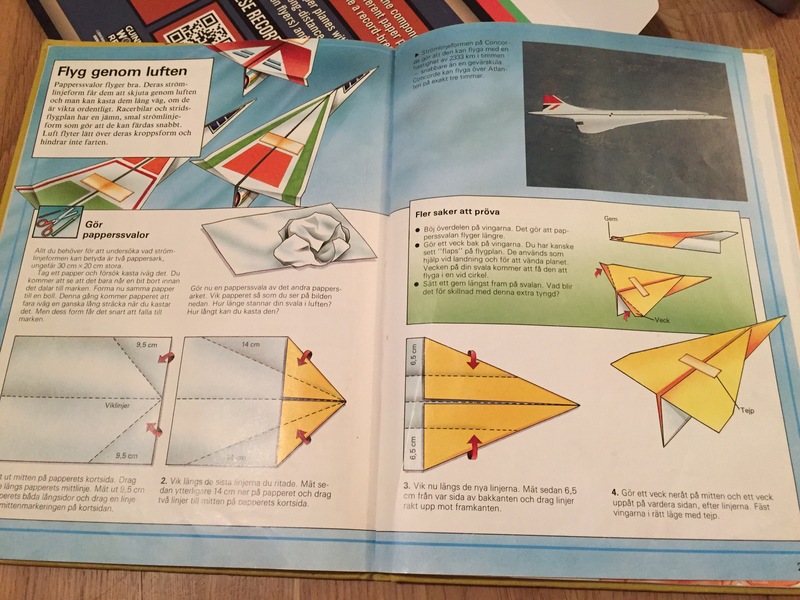 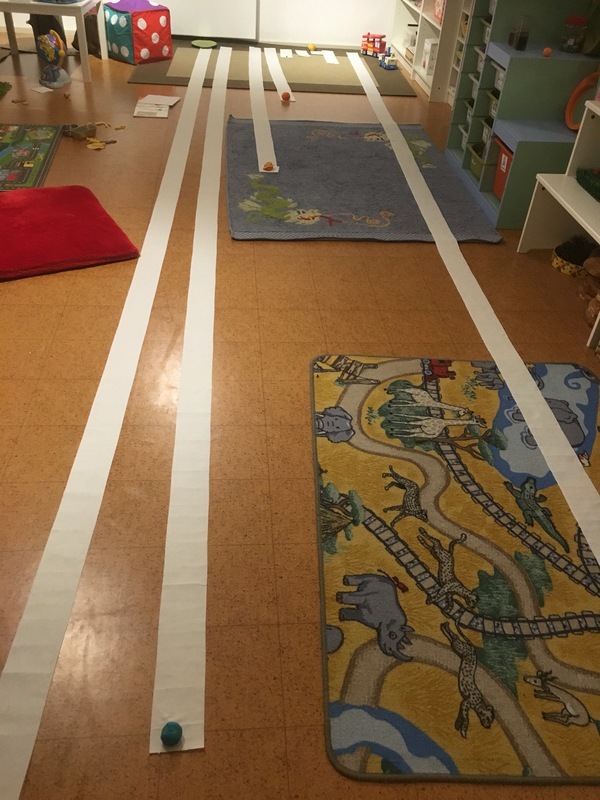 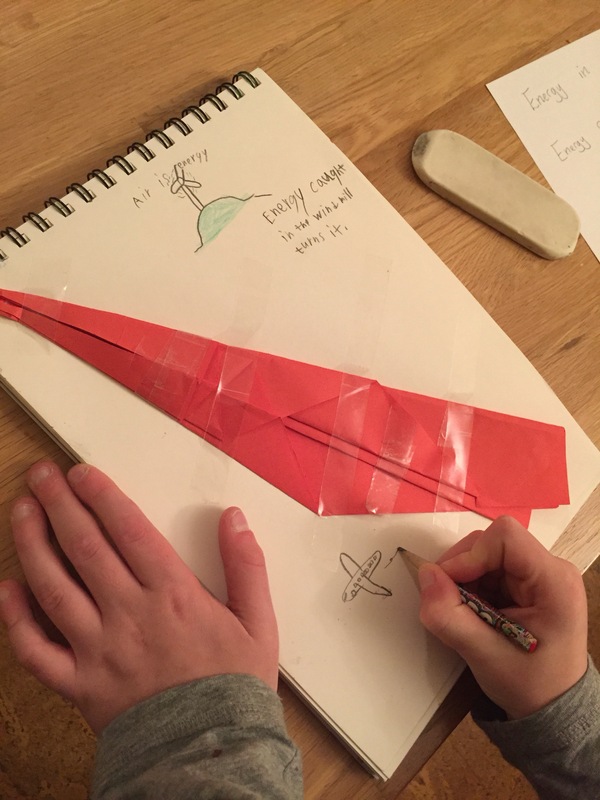 When we had done this, we went down to the playroom, and using toilet paper, and a chart, we measured how far each planet was from the distance of the sun…. 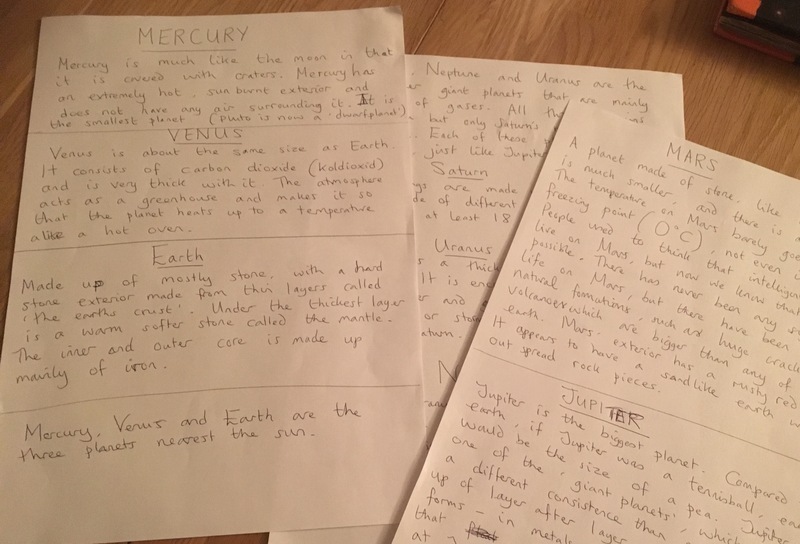 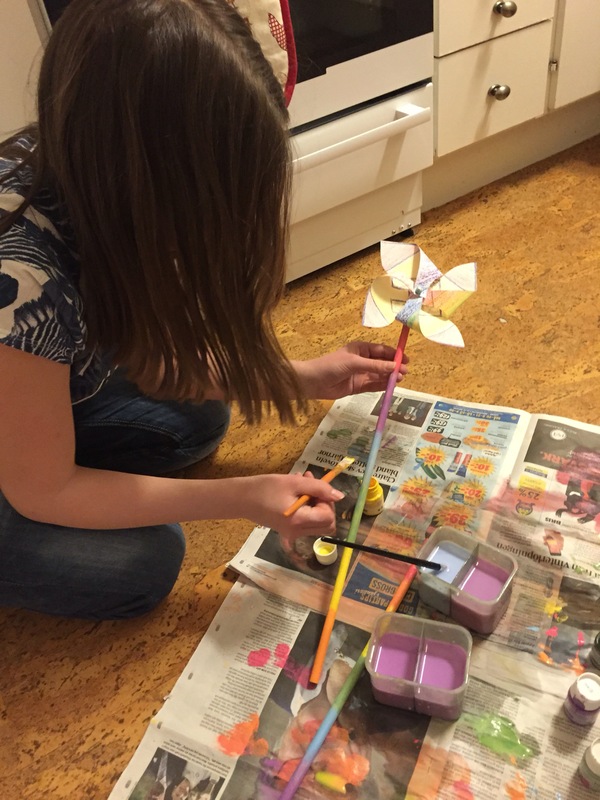 A fabulously fun way to learn about the solar system!